Selecting the proper anvil will help ensure accurate hardness measurements. Newage offers a range of various styles of anvils to help ensure that the sample remains stationary. Our selection of anvils come in various styles, and help ensure that the sample remains stationary. Newage anvils are available in many sizes for Newage and competitive hardness testers with 0.75”, 20mm and 25mm anvil posts from Wilson®, Buehler®, Clar®, Mitutoyo®, Starrett®, Instron®, United® and others. Always ensure that your anvil’s top surface and its supporting contact surface are free of dirt, grindings, oil, and of corrosion. If an indenter or other object has left a mark on the anvil surface, you should replace the anvil, since this can contribute to incorrect hardness measurements. Newage anvils include diamond-type, flat, spot and vee-types. 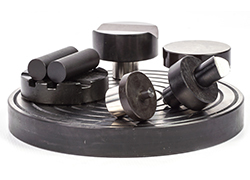 Specialized anvils are available such as flattened ball anvils for non-parallel testing surfaces or vee-notch anvils for testing samples having tapered rounds. Click on one of the menus below to see the full range of anvils. Request more information to see how we can help you with a hardness testing solution that suits your need. Anvil adapter, for use with Wilson and other 3/4" diameter post anvils. Anvil, flat, large, 4-1/4" diameter, shank 20 mm. Anvil, flat, small, 30 mm, 3" diameter, shank 20 mm. Anvil, vee, 3” (75mm),shank 20 mm. Anvil, flat, for King Brinell tester, shank 1/2". Anvil, vee, for King Brinell tester, shank 1/2". Anvil, dome, for King Brinell Tester, shank 1/2".